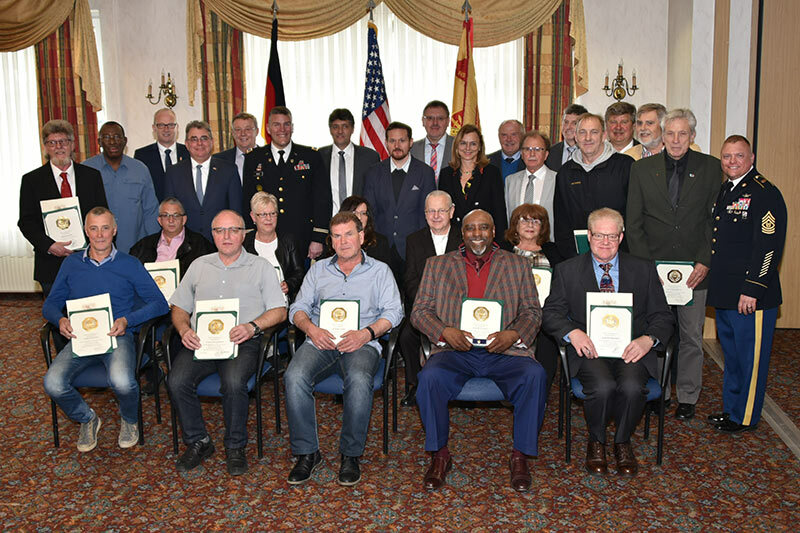 GRAFENWOEHR, Germany — Community members and garrison leaders honored long-time garrison employees at an Employee Length of Service ceremony, here, April 12. In total, 66 garrison employees logged 2,190 years of total service to the U.S. Army and federal government. “There are honorees among us that have worked longer for the U.S. Army than I have lived. I have the highest respect for this lifetime accomplishment,” said Dieter Gebhardt, the German works council chairman. Stephen E. Taylor celebrated 45 years of service and retired this year from the 7th Army Training Command Combined Arms Training Center. “I have had the pleasure of serving a total of 20 years, of my combined 45 years of military and Department of the Army civilian service, with the 7th Army Training Command Combined Arms Training Center. My fellow American and local national coworkers have provided the support and cooperation needed to complete all missions and keep my experiences with my job fresh and exciting. “Hopefully, I can continue to serve for the foreseeable future and support the NATO mission to preserve the liberty of Europe — I want that 50-year pin,” said Taylor. Col. Adam J. Boyd, commander of U.S. Army Garrison Bavaria, highlighted the importance of the civilian workforce in supporting the Soldiers’ missions, and what they have done in the past and will do in the future. “’It’s not the hours you put into your work that count, it’s the work you put in the hours,’ said Sam Ewing, a famous American baseball player,” Boyd said. In addition to the length of service awards, Boyd presented Army Antiterrorism Honor Roll certificates to garrison employees Richard Bertrand, Jelly Hollo and Tom Janis. The Quarterly USAG Bavaria Team Awards were presented to the postal service centers. The Army Professional of the Quarter Awards for superior performance were received by Ruslana Muzzy, Grafenwoehr/Vilseck school liaison officer, and Horst Zeitler, budget officer. Nine mayors from the local national cities of the honorees joined the ceremony to celebrate this special event. To view the photos of individual awardees, visit our “Length of Service April 2019” Flickr set.